ITEM 1712611241 - 48" x 120"
Hole Size (Diameter) 1/2" 1/2"
Sizes (Width x Length) 48" x 120" 48" x 120"
At McNICHOLS, you can choose from the largest inventory of Perforated Metal products in North America. Available in a variety of hole sizes and percentages of open area, with aesthetic appeal plus a high strength-to-weight ratio, Perforated Metal is used for sound enclosures, partitions, sign panels, machine guards, screening, filters, and more. Perforated hole types include Round, Square, Slotted, Hexagonal, and Designer. Materials include Aluminum, Carbon Steel (Plain Steel), Galvanized Steel, Stainless Steel, and Plastic. Product applications/uses include displays, exhibits, fixtures, partitions, cabinet inserts, guards, furniture, building facades, infill panels, screening, sign panels, filters, baskets, ventilation, security enclosures, and more. We invite you to browse Perforated Metal applications in our Product Gallery. Choose from a wide variety of Round, Square, Slotted, Hexagonal, or Designer Perforated hole types. Select primary material type including Aluminum, Carbon Steel, Galvanized Steel, Stainless Steel, or Plastic, taking into consideration climate or environmental realities. Inventory is typically “mill finish” unless otherwise specified. We provide our full selection of materials in the Materials, Finishes, Gauges/Thicknesses section. Decide on material gauge number or thickness in inches. The Gauges and Weights Chart offers additional information. Identify hole size (diameter), hole type (shape), hole center (spacing) and hole arrangement (staggered, straight row, etc. ), or Designer Perforated name/pattern. Choose the percentage of open area desired in the Perforated Metal sheet or coil. Specify solid margin preferences on width and/or length of sheet if required for your application. Most inventory 11 Gauge and lighter has minimum solid side margins running the length of the sheet and no end margins running the width of the sheet (material ends are sheared through). Sheets heavier than 11 Gauge typically have either a finished or unfinished pattern with corresponding end margins. Identify product size(s), form (typically supplied in sheets), and quantity desired, including cut-to-size pieces. Specify any requirements for special cut-to-size pieces, margin or edge treatments, finishing, leveling, fabrication, non-standard tolerances, etc. Determine if Perforated Metal Accessories such as Angle, Flat Bar or U-Edging framing solutions are required for your application. 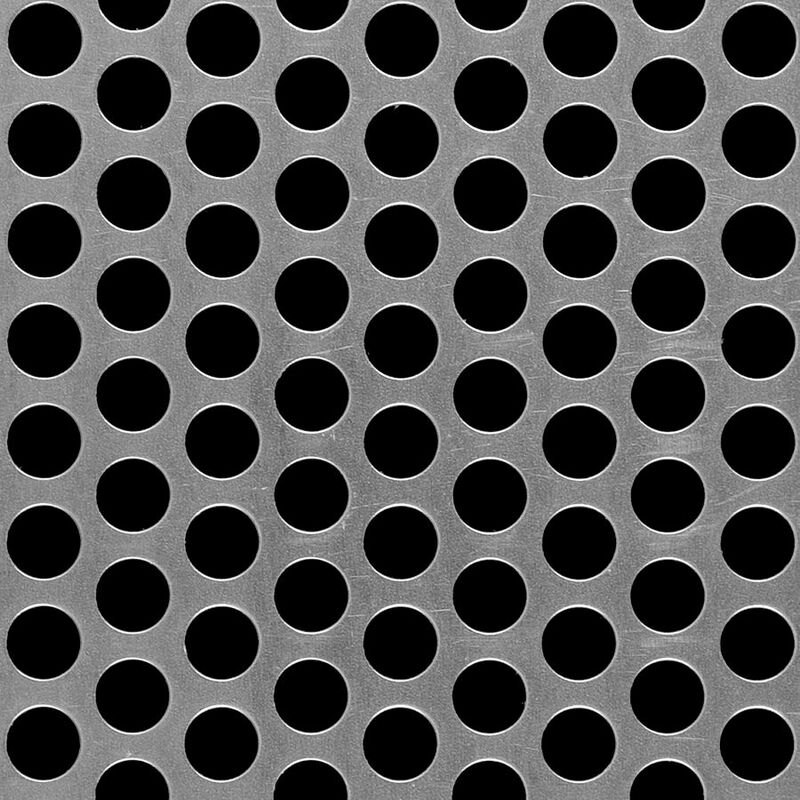 View McNICHOLS® Perforated Metal Resources on tolerances, types, available sizes, and more! Helpful McNICHOLS® Perforated Metal tables to save, print, or share! Sizes (Width x Length) 48" x 120"